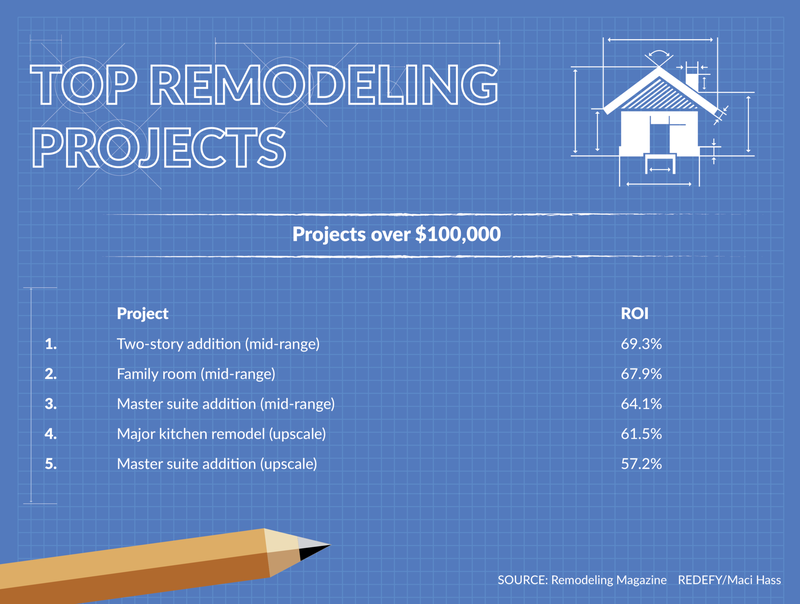 What Home Remodeling Projects Have The Best ROI? National averages for remodeling project ROIs don't matter. Look at the local numbers. Just because the cheaper remodel has a higher return doesn't mean it's appropriate for the house. Homeowners need agents to determine what remodels matter in their neighborhood. 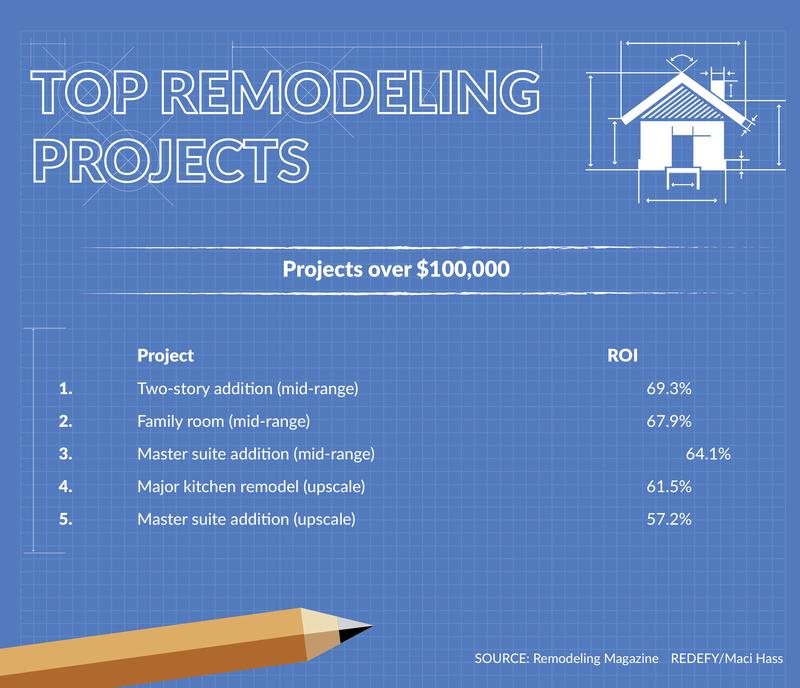 It’s easy to create a “top 10” list of remodeling projects’ return on invesment. But not all projects are created equal. Would you put a front door on the same playing field as a bathroom addition? So in the interest of a creating list you can actually use (and share with homeowners), let’s take a look at the top five projects by cost of project (using a pro) to get a better understanding of how these projects fare in the resale market. The lists created here are based on Remodeling magazine’s annual Cost Vs. Value report of 30 popular projects in 100 U.S. markets. 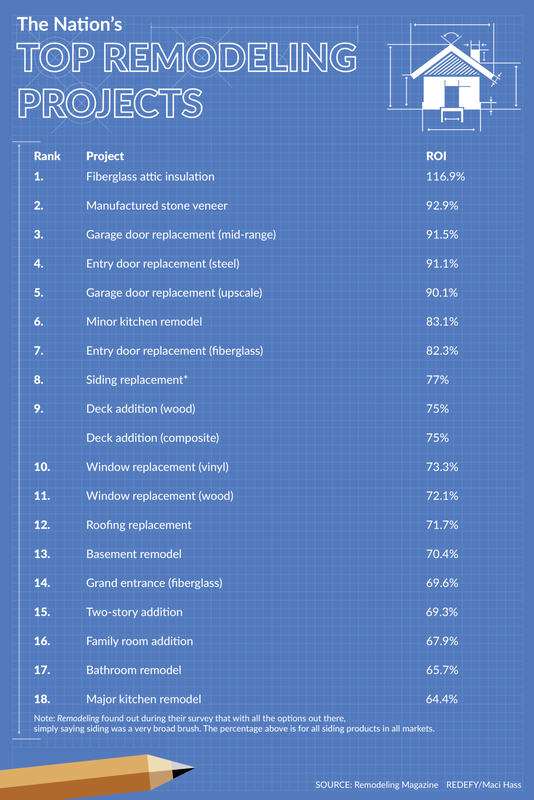 One factor remains the same across the country: the projects that cost the least resulted in the highest return on investment (except stone veneer). Would you put a front door on the same playing field as a bathroom addition? 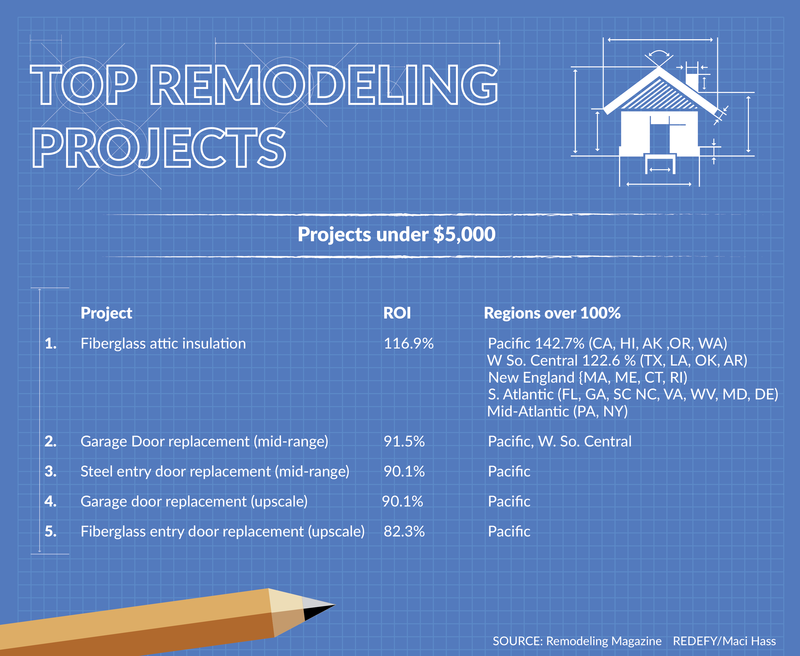 For some projects listed, you’ll see two categories of remodels: mid-range and upscale. Think of them this way: Toyota (practical, generally well-liked) and Mercedes (shiny, coveted). Digging deeper into the report, these national averages are just that. Averages. Take the time to check the regional and city data for your area. For some projects, there are wide swings in ROI. For example, the No. 1 national project falls to lower places in several regions. The one project that actually makes money nationally? Insulation. It sounds so boring, but it’s cheap to put in and saves a ton on energy costs. In New England, this jumps to a whopping 143.8 percent; however, the West North Central region (IA, KS, MN, MO, NE) only recouped 77.5 percent. Garage and entry doors aren’t a big surprise overall, since they speak to curb appeal and give the first impression that the rest of the house is up-to-date. Just because a steel door ranks higher for ROI than upscale fiberglass, it’s not necessarily the way to go. These choices really depend on the house and neighborhood. Remodeling decisions depend on the house and neighborhood. Anyone jumping up and down yet? Didn’t think so. These projects add some functionality, some better curb appeal and outdoor living space. The odd man out is the back-up generator, which might not seem that big of a deal until “snowpocalypse” hits (a real one, that is). 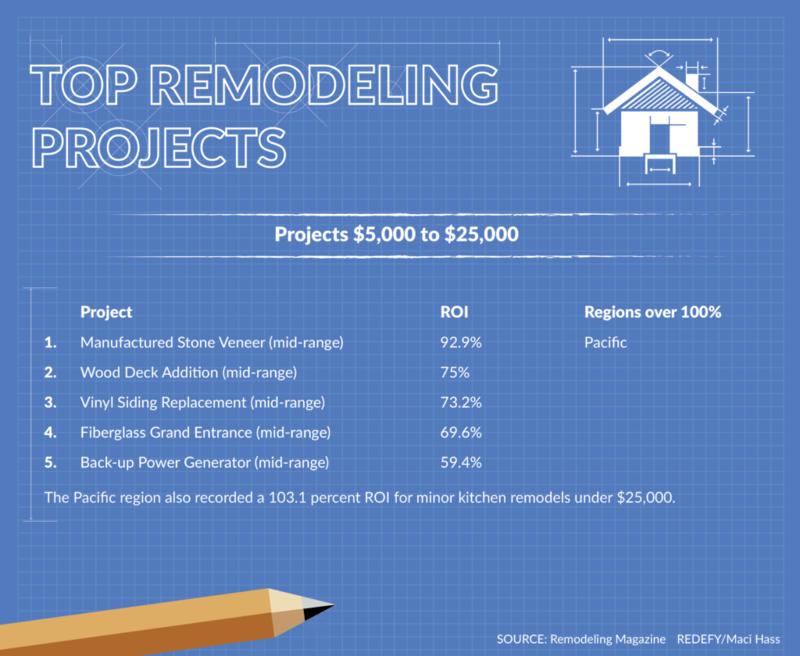 The Pacific region also recorded a 103.1 percent ROI for minor kitchen remodels under $25,000. Now here’s the stuff most people equate with projects that improve home values: modern kitchens and baths, plus a sweet low-maintenance deck. They’re much coveted, but the gains aren’t as high as you think. These remodels don’t quite fall into the “rich and famous” category, but they also don’t translate to the average remodeler. The national median single-family home sales price is $236,450, so a $100K-plus remodel prices out most homeowners. Again, the monetary return rarely meets expectations. Still want that top 10? We’ll see that 10 and raise you another. These national numbers represent a comparison of changes in home improvement costs with real estate pros’ perceptions of price at resale. So it’s a combo of fact and opinion. The data “reflects that better times are yielding higher returns,” says Hanley Wood Media, which owns Remodeling. Note: Remodeling found during its survey that with all the options out there, simply saying “siding” was a very broad brush. The percentage above is for all siding products in all markets. Chris Rediger is the co-founder and president of Redefy Real Estate. Learn more about Chris and Redefy on Twitter or Facebook.